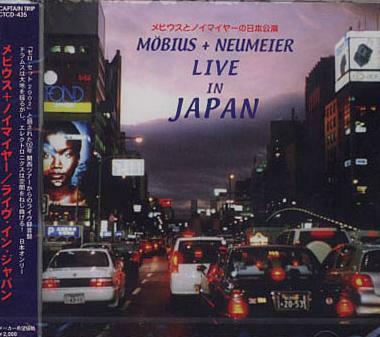 Mobius + Neumeier - "Live In Japan"
Recorded live on September 29 and 30, 2002 at two different locations in and around Tokyo, Japan. Best described as 'experimental noise', at least for the most part. Tracks that I liked the most were the atmospheric opener "Rush Hour 1(Shiga)", the avant garde "New UFO Catcher", the krautrock-like "Wasabi Eater II" (possibly the CD's best cut), the eerie "Is It? ", "Gel" and "Rush Hour II". A couple of tunes that I thought were part techno and part new age were "Weit Weg" and "Umator". Couldn't find much info on this - a one time-project? But there's a color photo of the two players on the inside, so I'll assume the live line-up was strictly a duo. Mani Neumeier (Guru Guru) - drums, percussion and bird calls with Dieter Mobius (Cluster, Harmonia) on synths, loops and audio generator. Running time is one hour.Might appeal to some fans of Cluster, later day Guru Guru, Faust, Neu! and related artists like Popul Vuh and possibly even Kraftwerk.